Art galleries like placing sculpture out of doors. They deserve to be encouraged. If they are willing to provide the supervision, display space can be found in parks. Nineteenth century art galleries resembled the drawing rooms of grand houses, with set places for each work of art. Twentieth century galleries became white boxes, to give exhibits an abstract independence. Some sculptors have turned rooms into single works of art. Each of these approaches can be used out of doors. 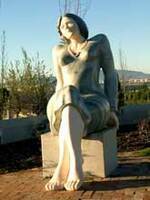 If a sculpture is placed at a focal point, it becomes part of the park design. Dumped inconsequentially on the grass, the sculpture treats the park as a characterless space. Too many sculpture parks are managed like this. It would be fun to have the gallery's influence radiating outwards, like radio waves. At one kilometre's remove, a bronze frog might poke its head out of a rainwater gully. Nearer, the pavement could turn into a colourful mosaic. The park wall, or railings, should not be at all like those of ordinary parks. Within the imparked space, visitors should have an artistic experience, whatever that is. Park design is itself an art which needs to be encouraged. Site-related sculptures can be incorporated.